Warts commonly appear on the bottom, or plantar, part of the foot, and thus called plantar's warts. It is caused by a virus, and is an opportunistic infection. 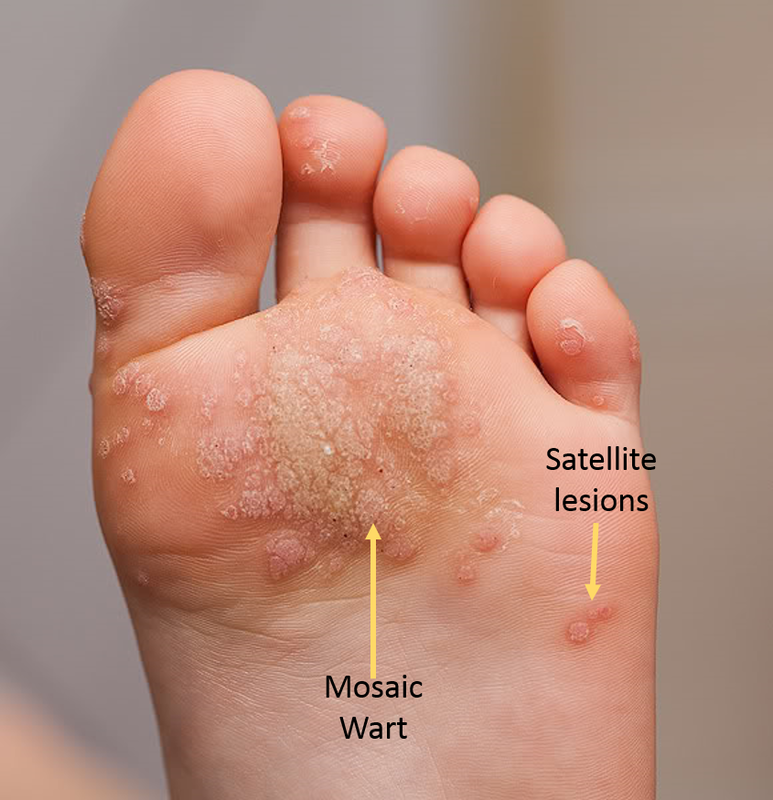 It really has nothing to do with hygiene, but more to do with if you are around someone else who has warts, or even public places barefoot where it can be tranfered to your foot through a slight opening in the skin. And once it is there, it thrives and lives between the epidermal and dermal layers of the skin. It appears as a lesion covered with thick skin, with pinpoint black or dark red dots. You will also see an interruption in skin lines. However, not every thickened piece of skin or every bump on the bottom of your foot is necessarily a wart. What else could it be? -It could be a simple corn or callus. On the bottom of the foot, an area of thickened skin is called a callus; if this occurs on the toes, it is called a corn. These areas of thickened skin occur over a bony prominence or an area with increased friction. Your own body tries to protect itself by building up layers of skin, however in the end, this buildup causes more pressure and cause pain. Examination of this buildup by your podiatrist will determine if it is a callus or in fact a wart. -It could be a foreign body. Yes, you could have stepped on something, it enters the skin, and it can be mistaken for a wart. Again, examination by your podiatrist will give you the answer. -It could be a clogged sweat gland, or a porokeratosis. Often these lesions have a central "core" of skin, but it is difficult to tell without seeing your podiatrist. If you have a lesion on the bottom of your foot, it is best to get it checked. That way, you can have a proper diagnosis and treatment plan right away. Call our office 630-834-3668 Prairie Path Foot and Ankle Clinic for an appointment today!